Food and Hunger System Overhaul! I've removed noodles as Fishg suggested. Spaghetti and Macaroni are gone, but that's okay since they were probably the most modern food out of the bunch. 1. Walk to nearest autocooker. 2. Grab a stack of food. That's already two steps more than I want to devote to food in MC. I voted in favor of a fourth bar because I feel that it would be better than xp rewards, not because I feel that it should be added. You might as well have hunger disabled. The point of food in Minecraft is to provide an extra challenge for Survival Mode. However, as you've described, it's mainly just a tiny nuisance. This suggestion is for changing that. This really sounds overly complicated. And more of an addon mod then a good change to the base gameplay of minecraft. However there are so many people who feel differently about the food system in minecraft. Some don't even want to bother with food. And having to eat in game is a pain. Others like myself would like more of a challenge. I mean come on , eating 3 carrots in 2 minecraft days should not be enough. I think there should be two new options in the main menu of how much foods can refill you. And the other being how fast you hunger is depleted. For example the refill bar could be set at 100% which would be the normal 4 drumsticks from a cooked steak. Or set to 75% at 3 drumsticks, 50% at 2 drumsticks , and 25% at 1 drumsticks. And the % value set would work for all the foods. Now foods with low refill amounts could only be reduced to half a drumstick which is base. This same % values could be used on the other option hunger depletion. This would be a good way to make the food system easier for some. And more challenging for others that want it. There's no good way to make eating food a challenge. You can't become skilled at a hunger system: all hunger systems are almost always going to be built on a timer, and you have to replenish that timer over time. What I'd rather have than a challenge is a reward system for exploring, farming and trying new foods. Rather than hunger being a weird micro-manage-y system that the player is racing against, the player is encouraged to make dietary decisions that will have long-term effects, kinda like real life. It's difficult for me to understand what you're saying since I think you used a period where a comma is needed, but I think you want options in the main menu like difficulty options. I don't really like this. Infinite amounts of game customization is fun and all when you're a map-maker or when you want to make modpacks or something, but I don't like the idea that the player is not just given, but expected to use heavily difficulty-changing options in gameplay. Actually, it wouldn't, you haven't changed anything. The current system is not a challenge, it's a timer that the player has to deal with using a minimal amount of preparation. Worse yet, a little bit of luck is enough to completely invalidate the hunger system. Spawning near a Village with plenty of farms will give you enough crops early-game that you will no longer have to worry about food as long as you replant the crops. A challenge isn't just something that requires speedrunning. It isn't about changing the values of a current system to make it harder. In fact, just because something is harder does not make it a challenge. A true challenge is neither a chore, nor is it an impossible task. A true challenge requires skill or it requires critical thinking and possibly innovation. If the player isn't beating a challenge through memorization or practice, the player needs to think through challenges like a puzzle. In my mind, the current food system is inherently flawed. You have so many items all doing the same thing. That is bad and requires we do one of two things. Wow, this is really a lot to take in. From what came through my mind. This update is to add features that are somewhat already present in mods, only made official. I do agree that the system today is very old. It has not received any major upgrades every since. I do not like the idea of a nutrition bar as another bar, although, maybe long pressing the food bar would show you the stats of your nutritional health. The game already has saturation in it. Adding a lot to the system could make the game less mine and craft and more eat to survive. It could really make surviving more complicated. For seasons, I do like the idea, I just don't know how this could be applied to other places of the world. Having the whole world in winter doesn't sound that bad but could interfere and cause much lag. The world is infinite(or 30,000,000 blocks), i dont know how to realistically put seasons somewhere. Great idea though, and great amount of effort. We really do NOT need any more food items in the game. And I really don't want Minecraft to end up as Atlas where I have to frequently deal with vitamins on top of hunger. This would be better off as a mod rather than in the base game. As long as the nutrient subcategories aren't necessarily "required" (maybe just providing some small perks that boost various movements and the like), this is absolutely what the game needs. We need some kind of enhanced variety where food is concerned. Also, it goes good with my rice and sushi suggestion. While the idea of relaxing the requirements for the player to eat vitamins/proteins is nice, I still want the player to move away from Rotten Flesh. That being said since the goal of my suggestion is not to punish the player for forgetting to watch meters, but to reward them for making good long-term decisions, this might make sense. That also being said, I still like the idea of protein being connected to the player's health regen, and moving quality meat items to a later part of the game. It adds a little bit of progression that makes the food system a bit more memorable in my opinion. As for more food items, this suggestion is not just a collection of more food items. The idea is to make new food items in the future more useful so that adding more food items is no longer about adding pointless sprites. The short answer is, you don't run world-changing functions on every single block in the ungenerated world. Instead, you change the textures that the renderer is supposed to use, so no blocks are actually changed. No. The food system should go back to how it was in Beta, not made even more insane. I think Cotton should also be a crop, which can be used to make string. Barley could be a wild Wheat variant found in the Plains. - Having a large number of food items is even less valuable. Now having food on you just means that you can heal yourself if you happen to get injured, whereas in the current system you need food to survive and sprint. Considering how easy it is to farm wheat and breed cows, this means food becomes incredibly underpowered. - Having a large selection of food types is far less valuable. At least in the current system, certain food types will keep you satiated for a longer period of time than other food types. With the Beta system, there is no difference between Apples, Bread, and Steak, as long as you can munch down on them fast enough. - With no real need for different food types, the little bit of progression in the food system that currently exists disappears entirely. At least, at the moment, the player is encouraged to farm crops for food, then when he finds enough cows, he can breed them to make steaks to feed himself for the rest of the game. With the Beta food system, the player is not encouraged to farm Cows, the only reason to do it is in case you manage to survive an attack with a half-heart of health and you want to heal in half of the time it would take compared to bread. The thing about my system is, you actually don't have to do a lot of math to deal with the hunger system. Vegetables will still feed your protein amounts, albeit not as much as meat. This means eating vegetables is enough to keep you alive, but for additional benefits, the food system rewards players for farming meat, trying new foods and cooking new meals. Cotton sounds interesting, although I think it's outside the scope for a food-related suggestion. Barley sounds a bit too close to Wheat to add, though. Considering we already have Corn and Rice after this suggestion, I don't know if we need a fourth grain. Screw sprinting. Its relationship to the hunger bar never made any sense to begin with. Why should there be a difference? Why should having a large selection of food types be valuable? Screw potions. They should be removed too. It does make sense. Sprinting requires energy, therefore keeping a constant supply of food on your person is required to go fast. Considering how it takes only a few days of playtime to get so much wheat that quantity-wise food becomes a non-existent problem, the player needs a use for large quantities of food on journeys. At the very least, rewarding the player with a slight speed boost for the little extra effort he puts into farming makes a bit of sense. Because this is Minecraft, where we have a large selection of different kinds of types of everything. Different trees, different stones, etc. Not only that, but I already specified the reason why in point 4, which you conveniently ignored: it adds progression. While new food types in themselves are not valuable practically, people do find aesthetic value in them, and they do get used in certain other recipes not related to food. The problem is that food items do not get removed in the game. We can't go backward. Therefore, a system is required to make a large plethora of food items valuable to the player and to support the addition of new food types. 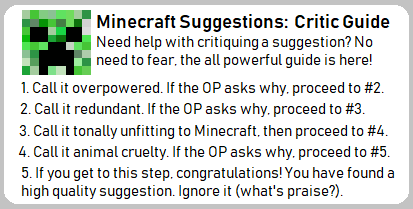 A: Go back to a previous version, which Mojang conveniently allows you to do. B: Go play a different game, if A didn't recreate your nostalgia than removing features from the game isn't going to do that either. If it's in your interest to chop off parts of the game in an attempt to recreate a game that only you are nostalgic for, you clearly have no place arguing for or against adding features to the current game. 1) As a concept, the crafting system adds a use for magical items in the world. Ghast Tears, Gold, etc. are made more useful by potions. 2) This new crafting system, although boringly simple (it should be both procedural and algorithmic IMO so that the player has to use his ingenuity to brew good potions), adds new progression. 3) Potions and potion-related items are useful aesthetically as chemistry-related items. 4) Potion Effects add a new dynamic to combat along with Enchantments. 5) Potion Effects are a good way of implementing certain temporary powers that the player might find useful. Night Vision, Swiftness, Jump Boost, etc. 6) Potion Effects are useful for adventure maps. Slowness has been used in the past as a way of stopping Villagers or other mobs from moving. Oh look! A nostalgia nerd! Let's kill it with potions and wither and elytra and tridents and crossbows and pandas and everything that's been added since Beta 1.8! Seriously, I hate nostalgia. Minecraft is only going forward, never back. It does make sense. Sprinting requires energy, therefore keeping a constant supply of food on your person is required to go fast. But sprinting in the real world doesn't make you hungry. It makes you tired. I would have wholeheartedly supported the addition of a stamina bar to put a limit on sprinting, but that's not what we got. We got this nonsensical hunger integration instead. Because this is Minecraft, where we have a large selection of different kinds of types of everything. Different trees, different stones, etc. Oh, so either you have the short-term memory of a pothead or you don't understand what context is. Got it. I guess I'll have to get out my good crayons to explain this to you. The question that I asked wasn't "why is it important for THE GAME to have many different food types?". The question was "why is it important for THE PLAYER to have many different food types?" The problem is that food items do not get removed in the game. We can't go backward. No one is talking about removing food types from the game. No one is talking about going backward. You have committed a strawman fallacy. Go learn basic logic before you try to argue on the internet. Therefore, a system is required to make a large plethora of food items valuable to the player and to support the addition of new food types. EDIT: food does not exist for its own sake. It does not exist to provide a realistic simulation of human nutrition. It exists to provide the player with a means of regaining health. Originally, the reason why multiple food types existed was to give the player multiple strategies for acquiring food: hunting for pork chops, farming for wheat/bread, and logging for apples. Mushroom stew was also in there, mostly so that mushrooms wouldn't be useless, but mushrooms weren't common enough for this to really matter. Shortly afterward, fishing was added, bumping the number of food-gathering strategies up to four. Every new food type since then has been a useless distraction because none of them have opened up new ways of gathering food; they're just extra things that you can get from the existing strategies. The addition of the hunger bar was a terrible idea because it added complexity to the game without improving gameplay or giving the player more meaningful decisions. And here you are, doubling down on past mistakes, advocating that we swallow a bird to catch the spider. NO! Bad! Take a look at The Legend of Zelda: Breath of the Wild[/i]'s food system, which is similar to that of Minecraft Beta 1.7 (which I'm sure you play). It lets you eat food to regenerate health [i]at any time[/i]. This means that it is possible to mitigate any damage done to you (unless it is fatal), making you effectively invincible (unless you run out of food). Minecraft's hunger system is much more reasonable, making it hard to regenerate health in battle (except for golden apples and Potions of Health).